France, 1680. Louis XIV, the Sun King, is at the height of his power. The court at Versailles is a paradise for privileged young women. Jeanne Yvette Mas Du Bois is unlike most other courtiersand her thirst for knowledge often incurs her father’s brutal wrath. But her uncle encourages Jeanne’s independence, secretly teaching her fencing in the palace’s labyrinthine basement. When two of the king’s Musketeers are beset by criminals who are mere feet from Jeanne’s fencing lesson, she intervenes, saving one of the Musketeers’ lives. Hidden behind her mask, Jeanne is mistaken for a man. When two of the king’s Musketeers are beset by criminals who are mere feet from Jeanne’s fencing lesson, she intervenes, saving one of the Musketeers’ lives. Hidden behind her mask, Jeanne is mistaken for a man. As “Jean Luc,” Jeanne is admitted to an inner circle where she learns of an assassination plot against the Queen. As Jean Luc, she is permitted to bring her intelligence and swordsmanship to bear. Also as Jean Luc, she is free to love the man of her choosing…even if she can never have him. Now, with the Queen in jeopardy, and her own double life making her privy to the tangled intrigues at court, Jeanne is in a powerful—yet increasingly perilous—position. 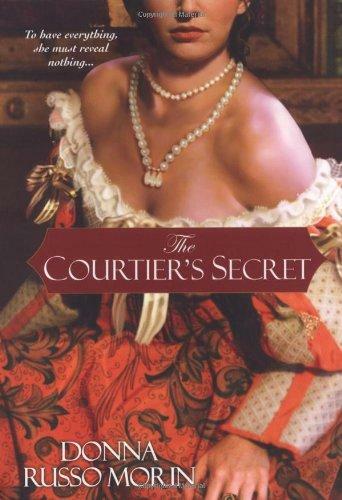 Brimming with lush period detail and vivid, unforgettable characters, The Courtier’s Secret takes readers into a fascinating, intriguing world of pageantry, adventure, betrayals, and secrets. Donna Russo Morin is a graduate of the University of Rhode Island, where she obtained two degrees. In addition to writing, editing, and teaching, Donna dabbles as a model and actor, using yet another imaginary world to help support her real one. Donna’s two sons, Devon and Dylan, are her greatest works in progress. How would you characterize Jeanne du Bois? What is it about her that makes her unique from other women of her era? How do these differences affect her life, both positively and negatively? In Chapter One, Gaston du Bois pulls his daughter through the palace “like a dog on a leash.” How is this similar to his manner of parenthood? What are the consequences of his behavior, not only immediate, but long term? How do his attitudes toward his three children differ, and why? In Chapter One, Jeanne describes her frustrations at the limited choices in her life to her mother, saying, “I cannot bear a life where the most momentous decisions I have to make are what to wear and what to serve. It is too meaningless and trivial. I want to learn things, study, be a part of the world.” Do you feel the women of today experience the same problems? In what way is it the same? How have things changed? How does Jeanne’s attitude frame the entire story? How do Jeanne and her friends Olympe and Lynette differ in their desires for their lives? How are they all representative of the women of their era? In what way do they all ultimately receive what they want? What does Jeanne mean when she says, in Chapter Two, “How can my love of God be measured by how deeply I curtsey to the nuns?” What other events and statements reveal her inner feelings of religion, and how are they juxtaposed to her feelings about God? Why do you think Jeanne’s Uncle Jules helps her with her disguise, enabling and encouraging her to lead a double life? Athénaïs, the Marquise de Montespan, was one of the few married women to become a King’s mistress. What factors allowed it? What in her past ignites the fear of François Scarron in King Louis’ life? Is it just an advantageous match Gaston demands for his daughter or is there more to his insistence upon Jeanne marrying Percy de Polignac? What other advantages were there for arranged marriages? Could such a practice be possible in today’s society? How do the memories of the Fronde affect Louis and the manner in which he rules? Is his response reasonable? Why did his people continue to love him, both peasant and noble alike, regardless of his ill treatment of them? To what extent does the particular time in history in which the story is set influence the tone of the story? Why does Henri d’Aubigne hide his family connections? What does he fear would happen if they became known? How does his behavior differ from most others of the age? In Chapter Thirteen, Queen Marie-Thérèse d’Autriche utters the famous quote, “Let them eat cake.” Which other Queen of France is most often, and erroneously, credited for the divisive statement? In Chapter Eighteen, Jeanne describes the frightened look of the deer as it is hunted down. What does the deer symbolize for her, and in what ways? As Jeanne says good-bye to “Jean-Luc,” she acknowledges that she will miss him, but that she no longer needs him. In what way did she “need” him before? What changed to dispel her need? Stories of Musketeers have enjoyed popularity since the first, written by Alexandre Dumas in the mid 1800s. What is it about the tales of these men that is so enduring? Are there any similarities to another group of like-minded warriors in modern-day stories? How are they alike? The truth of this story lies in the internal conflict raging within Jeanne. What is that conflict?